That's me at the entrance of Chili's, The Mall branch. 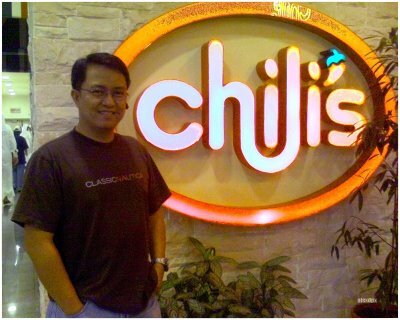 Chili's has been a very well known restaurant in Doha since it opened its first branch in the Ramada Signal Area. This would be the intersection of Salwa Road & C-ring Road (yeah, like that helped the non-Doha residents visualize where the location is). Now, for about 6 months now, they have opened a new branch at The Mall in D-Ring road. The area is more compact and the atmosphere is somewhat a different experience from its other branch which has double height ceiling. The service crew comprise mostly of Filipinos - from the greeters to waiters, to cashiers. Perhaps we came in with an All-Filipino shift. But my wife and I loved it. They were warm and friendly to us and our server even managed to crack a joke or two which delighted us. Not that I don't like other crews or server. It's just so much easier when you speak the same language. Anyway, let's talk about the food. Since it was getting late, my wife & I opted for a light meal. She ordered an appetizer called Triple Play, while I had a Smoked turkey Sandwich that comes with small bowl of soup of your choice. I chose chicken and mushroom soup. 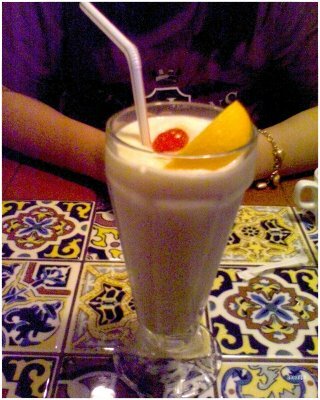 For our drinks, she had a refillable mug of iced tea and for me, an alcohol-free pina colada. The iced tea she had was not the usual instand Nestea served in many restaurants in Manila. This was real tea made hot and then cooled with ice and then sweetened to taste with syrup, not solid sugar and squeezed with real lemon. Definitely a lot better than instant iced tea. The Pina Colada, despite the absence of alcohol was quite good and refreshing. However, I think that they could have blenderized it a little more. It was a little difficult to sip with the small straw given. Perhaps a bigger straw would have solved it. The alcohol-free Pina Colada on the ornately decorated ceramic tiles tabletop. 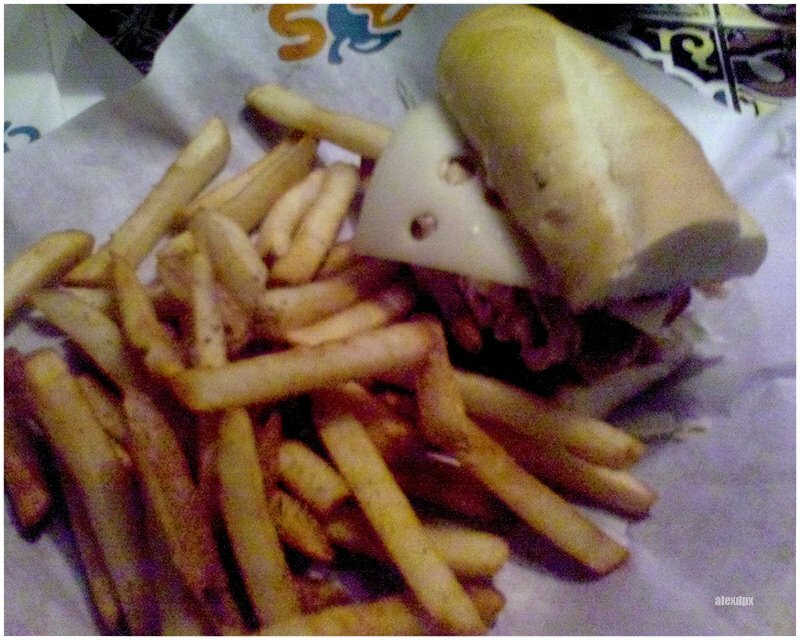 The turkey sandwich was satisfying enough and actually tasted good. It was served with chips (or french fries as the Americans and the Americanized would choose to cal it) but I didn't bothered much with it. McDonald's french fries are my favorites. Smoked Turkey Sandwich comes with chips (french fries). The chicken and mushroom soup was a little different from what I usually have. For such a small bowl, it was filled with dices of chunky chicken meat. 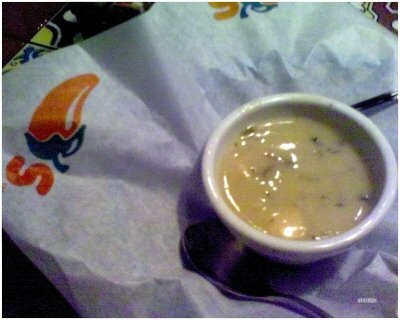 The mushroom was rich and creamy - and hot and spicy. Now that's the twist. This is the first time I've had chicken and mushroom soup that's hot and spicy. But only just. I'm not a big fan of hot and spicy food but this one is just nice. I liked it. Chicken & Mushroom Soup. Chunky chicken dices - and hot and spicy. Nice! I can't say much about the Triple Play my wife ordered. I just had a bite of the chicken lollipop and I think it's quite good. 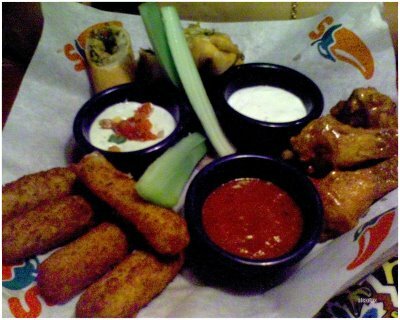 Triple Play with 3 different kinds of dips. I also liked some of the tiny details in the restaurant. Dining table tops are decorated with what looked to me like hand-painted (they could be printed) Spanish ceramic tiles. The seats looked proportionately small and yet they are spacious and comfortable to sit in. It's a very good restaurant, I might say. However, you have to be well-heeled because dining at Chili's is not cheap. For the food we had, we paid a total of QR 96 (US$ 26.30 or PHP 1,344.00) - imagine how much it would have cost if we ordered for a main course meal. Of course, Dining in Doha is really expensive when compared to, say Manila. But for what we had , I would expect the price to be shomething just a little more than half of what we paid for. But then, again, we enjoyed the overall experience so if you can afford it, I'd still recommend it.